At the intersection of cost effective and stunning in the kitchen countertop world, you’ll find granite waiting for you. Since it’s a naturally occurring igneous rock and isn’t man-made, you’re adding an element of natural luxury to your space without breaking the budget. There are literally hundreds of designs and color options to choose from, so there is bound to be a perfect slab out there for you. There’s a lot of information and pictures here on this page so use the table of contents below to navigate around and use the back button in your browser to return here. Is there anything out there more popular than white counters right now? They’re popping up in kitchens everywhere, and for good reason. They coordinate with just about any cabinet color and it’s a classic yet elegant look. Like the currents of a river, you’ll find that the sweeping lines of this white granite countertop perfectly complement any kitchen design. It’s versatile, works well with light cabinets and contrasts nicely against dark ones too. Since this design can be stretched along the length of the kitchen work surface, it can make any countertop look longer than it actually is. Kashmir with a glass tile backsplash and chrome faucet. If you’re looking for a white stone with just a bit of texturing, choosing kashmir is an excellent choice. 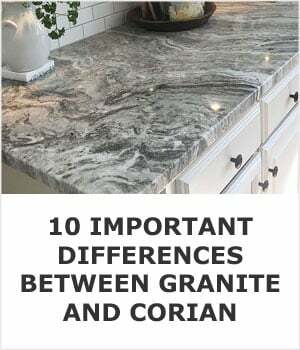 The salt and pepper look of the stone discreetly cloaks small countertop messes, which are harder to hide on light monochoromatic countertops that have less variation. If you’re having trouble finding it at your local stone yard cotton white is a similar alternative. 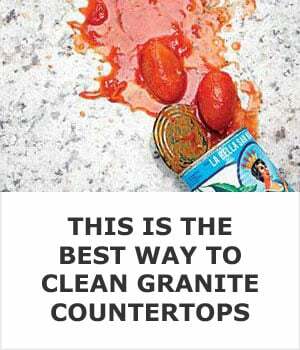 If you’re worried about staining granite and want to see how easy it is to maintain you’ll find this page helpful. This granite’s marbling is the statement piece that your kitchen has been waiting for. If you have a classic single-color backsplash, adding fun in your kitchen design with a slab of delicatus adds intrigue and effortlessly completes the look. Delicatus in particular can be tricky because each slab can vary greatly. Some are black and white while others have gold tones throughout like in the picture above. Paired with a beveled subway tile and mahogany cabinets. With a hint of pale blue, ice white granite would go well in any space with hints of cool and calm colors. Light or dark gray cabinets look amazing with this stone, so the combination is sure to warm the hearts of your guests once they see it. This sample image does a good job of showcasing the shades of blue you can find in ice white. Note how the hood over the range matches the island but the rest of the cabinets are white. Here’s a better look at the stone itself. This stone is one of the most grey of the white choices, which means it would add contrast to any light colored kitchen. It has even been used by some designers as a marble substitute for projects with a lower price point. It’s one of the cheaper options on this list, which means you can start your remodel immediately without any regrets. An interesting thing about black slabs is that many of them aren’t actually granite at all. In order for a stone to technically qualify as granite, it must contain at least 20% quartz, and quartz is always white or has a milky color to it. So if the stone you pick is completely black it’s likely gabbro, which makes for an excellent kitchen work surface, but you should know that all black slabs aren’t really granite even though that’s most likely what they are being called. Here are a few of my favorites. I’m defintely biased towards the last one so I saved what I believe is the best one for last. Absolute black pairs well with lighter cabinets and darker floors. For those looking for a sleek and modern look, absolute black is the way to go. This is the purest black granite that you’ll find, with little to no traces of any other colors found in it. Absolute black is a great choice to create the high contrast black and white kitchen you may have been day dreaming about and it looks great polished or honed. Ubatuba, mined from quarries in Brazil, takes on a wonderful jet black hue thanks to its’ abundance of mica. Ubatuba is one that you can buy for the awesome name, but keep for the quality. This granite is known for the gold specks throughout, though there are certain varieties of ubatuba that have red and green thrown into the mix. As a bonus, it’s is also kid-proof, since it’s tough to stain when accidents happen. Proper lighting like these pendants bring out the white flecks in black galaxy. It makes a very pretty and durable full wall backsplash as well. Black galaxy is the perfect name for this variety as it channels the look of a rural night sky. With small white flecks resembling the stars, this is a more family-friendly choice than absolute black since the flecks will help mask any messes and smudges, much like ubatuba does. Even though it has lighter flecks there’s not enough quartz in it to technically classify it as a granite. It’s composed mostly of gabbro. 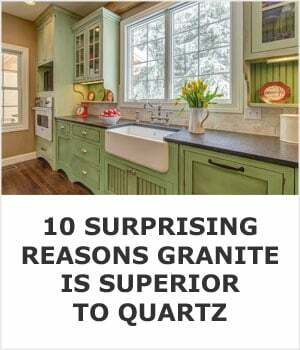 Did you know quartz is a countertop option too? 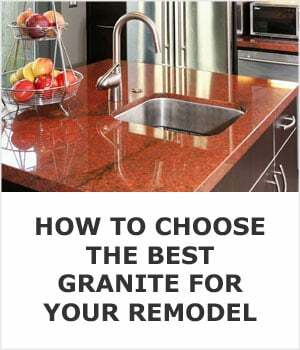 Here’s useful info on how it compares to granite. These brown pearl counters are polished to such a highly reflective surface you can see the faucet in them. For those looking for a something a bit on the wild side, brown pearl granite is a great choice. Brown pearl incorporates brown, black, and white to create a look that nearly resembles a mosaic and looks much more expensive than it actually is. I really like this kitchen and their use of brown tones in general, all the way up to the pendant light fixtures. Coffee brown is an option for those looking for something not-too-busy, but that still has depth to the design. This brown granite will appear as a near-solid brown from afar, so it will easily pair with any neutrals you want to bring into your space. There’s no limit to the different cabinet and countertop combinations that you can do in your kitchen. Some of the most popular options are to have contrasting cabinets and counters, but you don’t have to play by those rules. You’re free to mix and match colors any way you want so get creative and hold stone samples up to painted cabinet doors until the perfect combination turns up. Believe me when I tell you that the perfect combo will turn up, and when you see it you’ll know instantly that that’s exactly the one you’ve been looking for. While you’re experimenting with color palettes don’t let your floor tiles and backspalsh material be an afterthought. They go a long way to completing the look. We made a huge mistake when we updated our kitchen. We chose a ceramic tile for the floor but we said we would pick a tile out for the backsplash later. It’s been nearly two years now since our kitchen was done and we still don’t have a backsplash installed. Don’t be like us, make sure you pick everything out together and get it all installed at once. I do want to share some of my favorite combo with you and hopefully they’ll help you to come up with some interesting ideas for your own remodel. 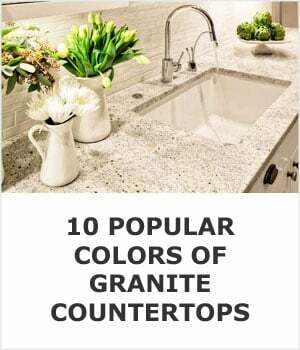 It’s my personal preference to have light colored cabinets with darker granite on top. It’s what we did in our kitchen when we remodeled it in 2017. We explored a few different options for the worktops including soapstone and quartz, but in the end we chose a darker granite because it’s a natural material that’s really easy to take care of. Pure white countertops don’t exist in nature, but if that’s the look you’re after you can find it with quartz. The closest you’ll get to pure white with a natural stone is pictured above in marble. Marble isn’t a very durable kitchen work surface but it’s definitely a beautiful one. Some of these white granite options may also work for you. This is a good look. The only thing I would have done differently is to use white on the floor too. It’s a bit too much wood for me but the inlaid strip of mahogany around the perimter of the floor is a nice touch. For even more options, any slab can be finished in a variety of different ways. A polished finish can bring elegance to the look by giving off a reflective mirror-like finish to the stone. A leathered surface is textured and is not glossy at all. They’re great if you’re concerned about etching or staining because the imperfections will be less noticeable. A happy medium between polished and leathered is honed. Honed finishes are smooth, matte finishes, that may still be slightly glossy depending on when the fabricator stopped working the stone. Like leathered, honed is also a great choice if you want to hide any wear and tear the stone may endure. This honed work surface will hide wear and tear much better than a polished one. Flamed has a bumpier finish that is perfect for any heavy duty usage from outdoor kitchens to shower flooring. 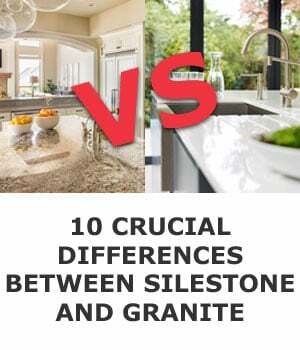 Remember, when choosing a stone, it’s incredibly important to go see your slab in person since each granite color can differ highly from cut to cut. You’ll never think about laminate again once you see what just a little bit more money can get you. Granite is the most versatile and budget-friendly choice of any stone, which makes it the perfect way to add luxury to your home without breaking the bank. 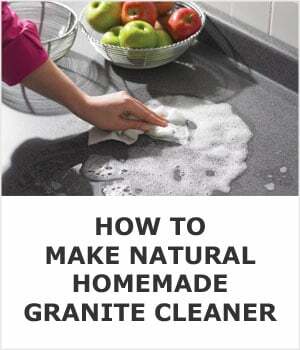 Want to learn more about granite? 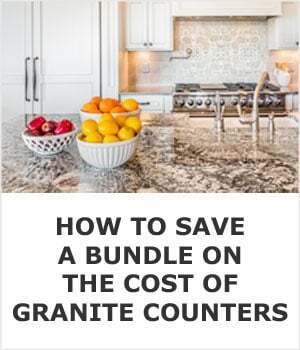 Here’s how to cut the cost of granite installation to get the lowest possible price; and here you can learn which types of granite make the most durable countertop. 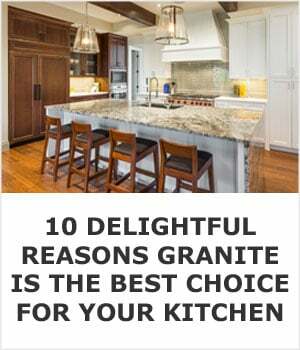 If those don’t interest you this page on Architypes lists all of our kitchen countertop articles. Ashley Rose Marino is the principal and owner of Ashley Marino Designs LLC in Dallas Fort Worth, Texas. After being immersed in the design world for 2 years, she decided to start her own business focusing on the simple premise of making homes happier. When she’s not creating for a client, she’s hanging out with her chiweenie and is planning her next trip abroad. You can visit her website at ashleyrosemarino.weebly.com or follow her on Instagram.